Decided to do some "Q" yesterday on the Egg. Made the potato salad early in the morning. Next was the baby backs into the marinade after removing the membrane. Then the Moink ball prep. I actually made a filling with sauteed japs, onion and garlic. When the vege was cool, I mixed in some Philly and colby-jack. The meatballs got stuffed, rolled in rub and wrapped with bacon. I used my cupcake/muffin tin thigh rig to cook them in. It was really easy to flip them at mid cook and all the fat went into the bottom pan. The rub was just some of Emeril's Rustic Rub mixed with light brown sugar. yup... yuh better be explenning yurself... uhh, please? ....'til Craig gets back....btw, looks mighty good, Craig! 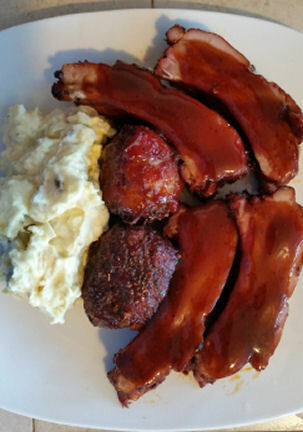 "Moink" is bacon wrapped meatballs..."moo + oink" = Moink. "japs" are short for jalapenos. I've learned more here at DC over the past 6 years, than the previous 20 before! To be more detailed, the original MOINK ball was a frozen "Italian Style" meatball that you wrapped in bacon and smoked on a smoker. For hard-core devotees, it has to be a frozen "Italian Style" meatball, and you have to spell it in ALL CAPS. I have made them for a lot of parties, and people scarf them up in minutes. However, I don't particularly like them, so I generally eat one or two -- if any. Well, Cheryl J and caseydog covered the explanation perfectly. I'm not one to leave a basic recipe and technique alone, so I did my own thing. We don't buy frozen meatballs so I made my own. I just discovered what are called "Turtle Eggs". Something for the next go round. MOINK balls I've never heard of but sound interesting. JAPS, as soon as I saw Cheryl's post I remembered reading it somewhere here. I think I even asked then what they were. Guess my memory is ... aw - never mind. "Of all the things I have lost in my life,I miss my mind the most".